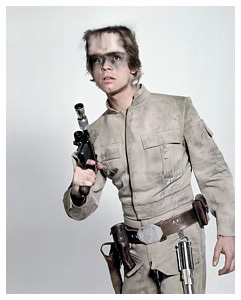 Welcome to Rebelscum's 2006 Halloween Costume Contest! This is our eighth year showcasing the most creative, outrageous, and just plain cool Star Wars Halloween costumes! Just like last year, we posted up a gallery of your Halloween costume creations for all to view, and gave away some terrific prizes to those who stand out above the rest. Be sure to check out our previous year's costume contest page for some fantastic costume ideas. Here are the winning costumes for 2006! We awarded first, second, and third prizes for both adults and children this year along with a couple super-secret bonus categories (see below). The prize packages all came courtesy our friends at Master Replicas, Gentle Giant, and Sideshow Collectibles - as most fans know, that's a trio of companies producing some of the best Star Wars toys and collectibles available today! You must include your name with your entry. At least one person in the photo MUST be holding a Star Wars action figure (any type, any size). We accepted submissions from Oct 17th until 12:00PM(PST) - 3:00PM(EST) on November 1st. Winners were announced on November 3rd. So what about the prizes? This year we decided that rather than just hand out a single prize for each category, we gave out cool prizes packs! Another huge thanks to our contest sponsors at Master Replicas, Gentle Giant, and Sideshow Collectibles for providing us was such a fantastic variety of Star Wars toys and collectibles to hand out! We naturally added a couple bonus categories, which included Best Pet and Most Humorous, along with a couple Runner-up places. Check out the lucky winners right here.